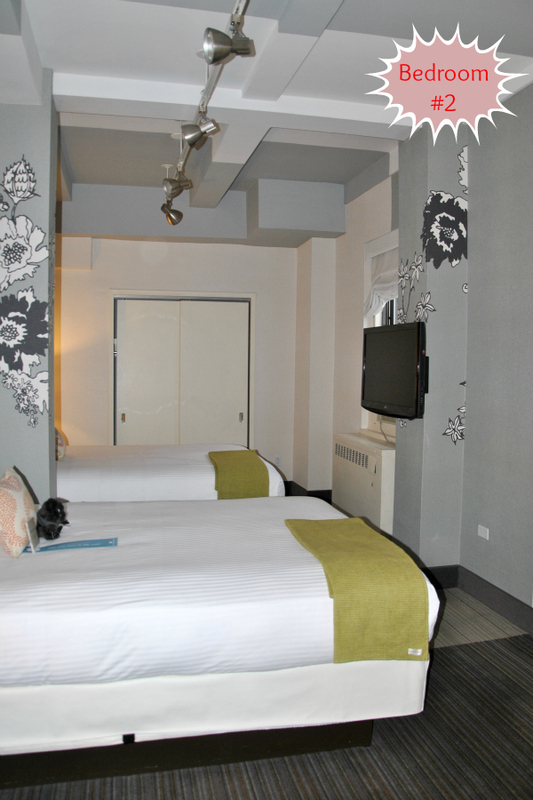 After staying at the Affinia Shelburne last year (see post) I was dying to experience one of their other NYC hotels. 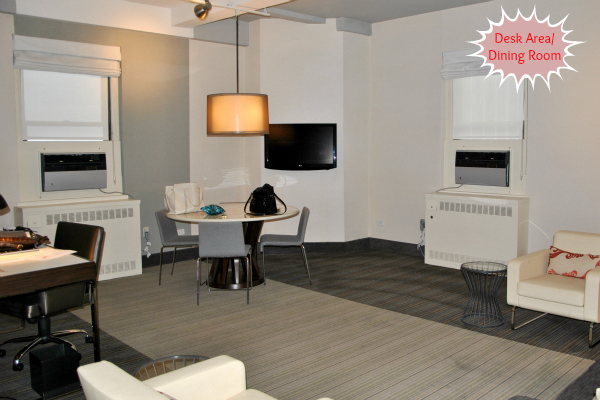 When Alyson, Kimberly, and I were looking for a place to stay I looked up their hotels and found at an amazing price a 1 bedroom (with 2 queen beds and sofa bed) deluxe suite at the Affinia Manhattan. We quickly decided to snag the deal and were beyond excited for our adventures in the city. 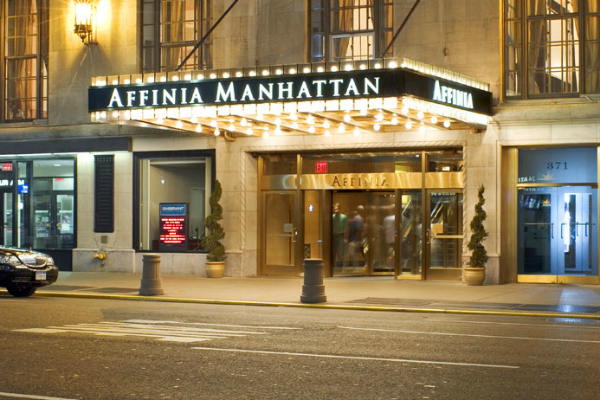 Little did we know one of the best adventures was going to be the Affinia Manhattan. After picking Kimberly up at the airport we quickly made our way into the city and arrived at the front of a gorgeous 28 floor hotel. We were quickly checked in as our bags were being unloaded and my car was being parked. As were were checked in the staff said to us that we're in a 2 bedroom deluxe suite on the 28th floor. Not thinking much about what she said as we were given a run down of the hotel and all it's amenities, we were then escorted to our room. What greeted us on the other side of the door was so much more than we expected. Turned out the hotel gave us a free upgrade to one of the largest and most beautiful suites in the hotel, filled with amenities galore and luxurious views. The decor in the newly remodeled Affinia Manhattan was so chic, subtle, and elegant. 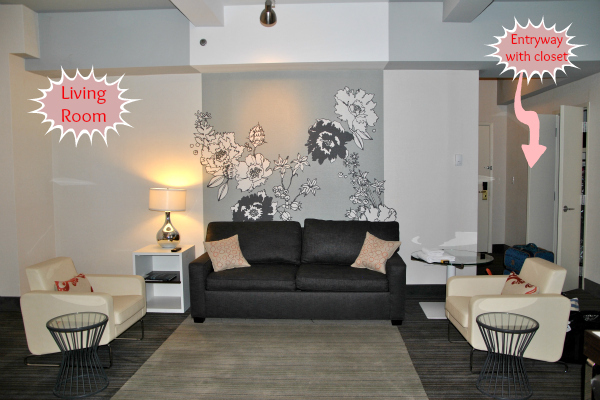 The colors didn't over whelm you but the designs on the walls and pillows was so intriguing and fun. When we first walked into the room we came right into our living room with a sleeper sofa, two side chairs, dining room table, and computer desk. The sofa bed was made up for us because at the time we thought we would need it, so in the picture above the coffee table is moved to the side. The living room was perfect for coming home after the conference and lounging around to discuss the day. It was also the perfect place to eat delicious room service and work on the next days post. 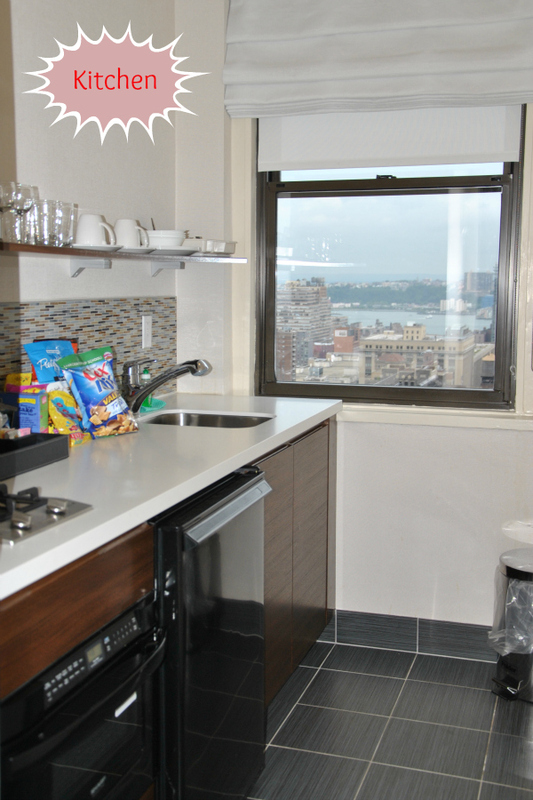 My favorite part of this kitchen was the view from the window. I spent so much time just standing there watching and taking in the views of the city and river. I needed to remind myself how lucky I truly was for having so many amazing opportunities like this come my way. I even made Kimberly stop what she was doing when we got there to come over and look at the city to truly take in the fact that we were in NYC. Sometimes I think we all get so busy that we forgot to stop and appreciate things. 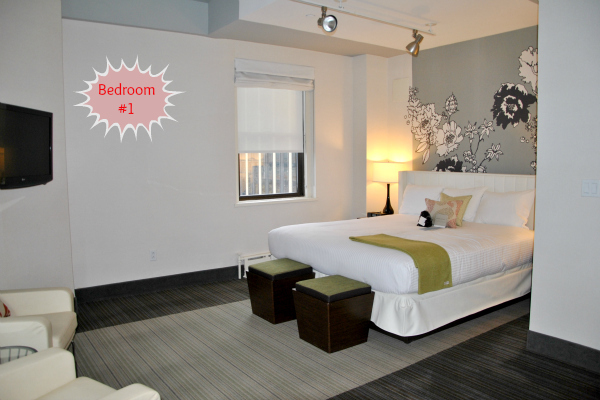 The second bedroom; which Kimberly and I shared; had two queen beds with night stands, closet, chair, and two windows. It was actually down a little hall from the first bedroom, and the hall held another closet and a bathroom. I loved that our beds each had a throw blanket which were perfect to crawl under if you wanted to take a nap or got a little chill. I spent most of the evenings in the bathrobes that were provided which made me feel a little like "Pretty Woman". While at the hotel we tried out their restaurant, Niles, and had an amazing meal with delicious food. The staff very helpful and Kimberly and Alyson even had them bring a desert out on a plate that said Happy Birthday. Talk about making a girl feel special. I honestly only have the best things to say about the Affinia Manhattan. 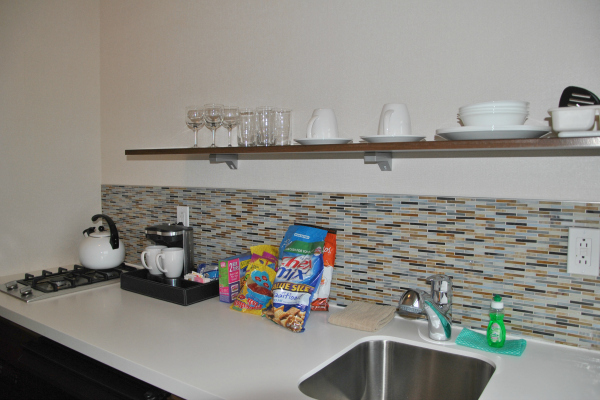 It was in the perfect location with friendly, happy, and helpful staff, the rooms made you feel comfortable and like you were at home, and they even had a little "Comfort Hour" where they gave you brownies! I think I can speak for all three of us when I saw we absolutely loved the hotel and had an amazing stay.Thank you Affinia! Sorry for the lack of pictures but after we checked in we had about 1 hour to get ready for the first cocktail party. I was in no way paid for this review from The Affinia Manhattan. I am simply just voicing my opinion and sharing with you, my reader, something I loved and found interesting. We're so glad to hear that you had a great experience with us, and thank you very much for this lovely, kind write-up! We hope to welcome you back soon. OMG AMAZING. I can't even believe you girls scored this - so amazing! Wow! Amazing room and view! Sounds like so much fun! Yes, it's a beautiful place indee, though a bit pricy. What a pretty hotel! Sorry we couldn't talk longer. Hope to catch up the next time you're in NY!